Creating an environment where employee benefits is top priority is an important investment for businesses, with more and more companies recognising the value of happy and healthy staff. Employee benefits are the way forward - and we can help you create a single a single home for all your staff benefit schemes. 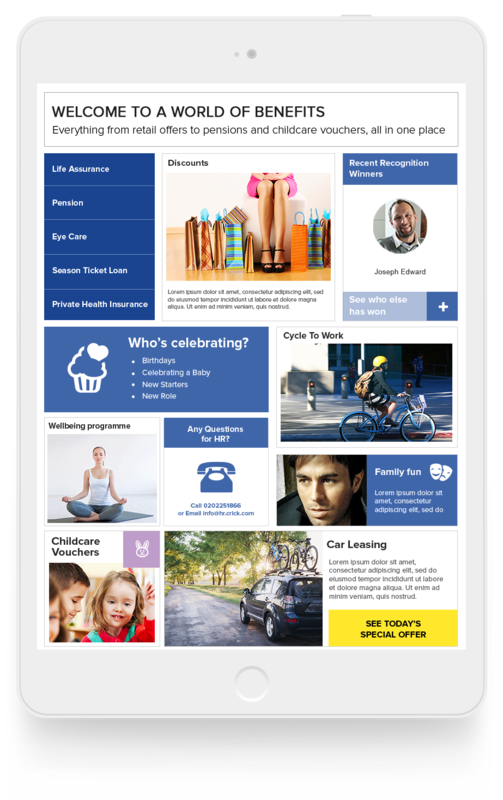 A bespoke portal offering access to all your staff benefit schemes, from retail offers to Cycle-to-Work scheme, all in one place! Brand the benefits hub to suit your needs and create a bespoke and familiar experience for you employees. Add bespoke HR news and announcements to staff. Add employee benefits scheme information, FAQs and enrolment dates. Add more schemes to your portfolio - making further savings for you and your staff. Our extensive functionality to create the reports and analytics you need is all delivered in real time and can be downloaded in multiple formats. Create bespoke marketing collateral and launch plans to drive the highest employee engagement. Salary sacrifice schemes improve engagement by offering employees and employers both convenience and discounted pricing. They allow employees to pay for a range of products and services via automatic, hassle-free, monthly deductions from their payroll, allowing them to enjoy the benefits of a more manageable cash flow together with additional tax or employer / employee national insurance savings.